I'm alive. In case you were wondering. My husband and I took a mini vacation without the kids to go to a wedding in Colorado. We left last Thursday and returned home yesterday afternoon. We had a great time, but I am glad to be home. I sure did miss my kiddos. Since I have done nothing crafty this week, I thought I would do a little giveaway. Remember this magazine I showed you several weeks ago? Would you like the chance to win your very own copy? You are in luck. All you have to do is leave a comment and I will use a random generator to pick a winner on Friday September 18th. 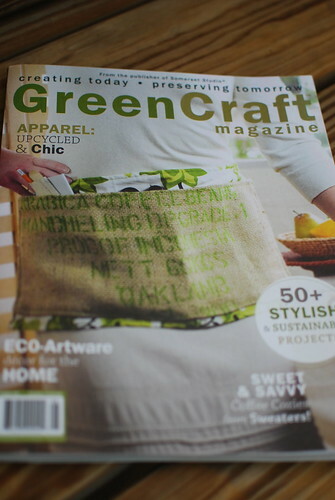 This magazine is so inspiring and has tons of great green craft ideas. 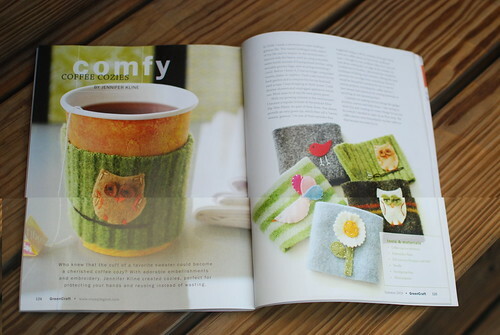 I will also have some copies along with the cozies that were featured in the magazine for sale in my Etsy shop soon. I would love to see that magazine, so count me in! Hope you had fun on your mini-vacation. It is nice to just get away for a bit sometimes. I was MIA last week, too, since I was just busy sewing, sewing, sewing. i would LOVE that! not to sound all geeky or anything, but would you sign it too? that would be cool! Ooo! Count me in! Welcome home. The taggie is perfect, by the way! Thanks again! Me, me, me! Pick me! :-) I actually have the magazine on my wishlist for Christmas already - it looks so crazy sweet. A weekend with the hubby sounds loveeely! Another geek here. If I win, then please sign mine. I have reduced the amount of magazines to zero that I now subscribe to and am feeling magazine withdrawal. I've been considering adding one of two, but want to be sure I'm getting more value than mindless busytime. I would enjoy going through it and finding some crafts I could do w/my kids for arts & crafts in school. I would love a copy of this magazine! The ideas are great, and I love your crafts represented in it. Thanks!